Besides mimicking Animal from “The Muppets” when I was five, I only really started playing music when I was nine. I played the organ, and soon ditched that to take up the tuba in Grade Seven. The tuba led to the bass guitar in Grade Eight, because both are notated in bass cleff. These progressed until Grade Twelve, when I shared the Most Outstanding Musician Award, then went on to study music at Mount Royal College in the Jazz Performance program. Music didn’t just happen for me; it was unavoidable. My mom, dad, brother and all six of my uncles, on both sides, are all musical. Jazz of all kinds is what has influenced me the most. It’s what I like listening to the most, and what I’ve learned the most from. It comes in so many shapes and sizes that it satisfies all my tastes. Junky, smooth, hyper-fast and really slow, but always very cool. Of the people I’ve seen live, my favorite is Bela Fleck and the Flecktones, mostly due to the fact that their bass player, Victor Wooten, is probably the most progressive bass player ever, next to Jaco Pastorious. 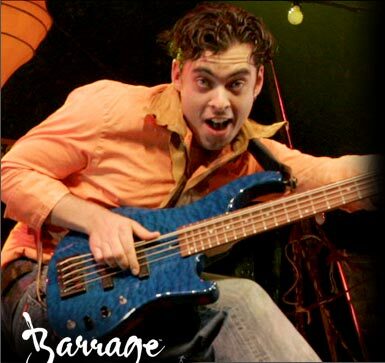 He has developed techniques that allow him to create rhythms previously impossible on the electric bass. I’ve drawn from this in some ways, but also, his sense of groove, the almighty quarter note, and pure imagination are especially inspiring. He’s like water in a jam session. He takes on any form he must to fit. Another influence of mine was playing in a punk rock band for two years called Belvedere. It was a valuable learning experience, because not being into punk music at all meant I had to figure out what it was about that music that made it work. I learned to play really fast too. Nowadays, they’re touring with Bad Religion. One last major influence has been playing with Barrage since October 1998. You never have to clean your room (like I ever did anyways, but hey). Also, you always eat in restaurants – though fun for a while, soon mom’s meatloaf starts sounding really good. Ah, meatloaf with ketchup and corn with butter and chocolate milk with a microwaved snickers bar for dessert. Mmmm!! But as far as performing on the road, I’ve learned that to make a performance comfortable to play, you have to know what to listen for on stage. For me, I focus mostly on the drums and guitar, and the rest is kind of peripheral. I listen to these two, because, as a bass player, I am a mediator between rhythm and harmony.